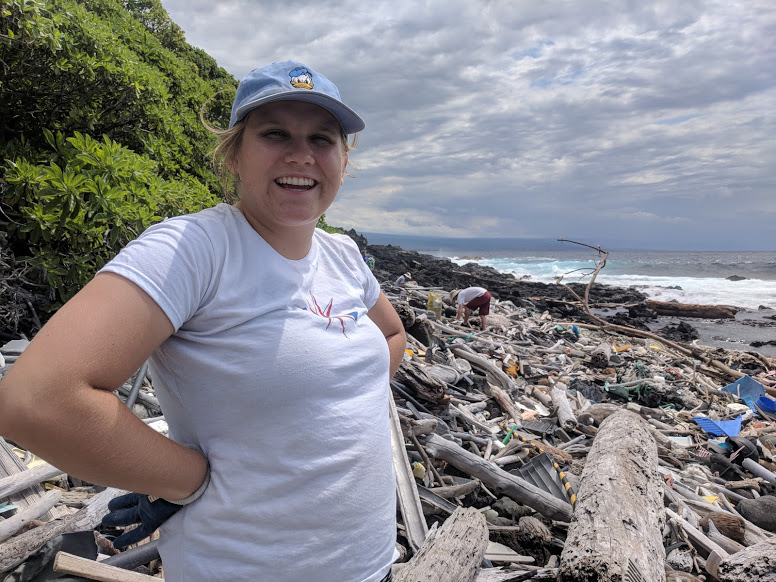 Hello, I’m Michaela Harris and in my blog, I will address New York City’s “Trashtastrophe.” Ever since the Dutch settled on our soil in 1614, garbage has been accumulating over the vast landscape that I like to call my second home. Some of the most famous parts of the city were even built on landfills such as Ellis Island, Rikers Island and Battery Park. Not only is the trash affecting the city, but it is also polluting the Hudson River and the Atlantic Ocean which are some of the main tourist attractions and largest ecosystems in the Northeast. Additionally, about 80% of the 14 million tons of trash are then shipped to China where it eventually makes its way to the Great Pacific Garbage Patch, destroying numerous ecosystems, habitats and the tourism industry of Hawaii along with other nations affected by this disgrace. This means that the trash from one of our nation’s most beloved cities is contributing to one of the worlds most detrimental and overlooked problems. 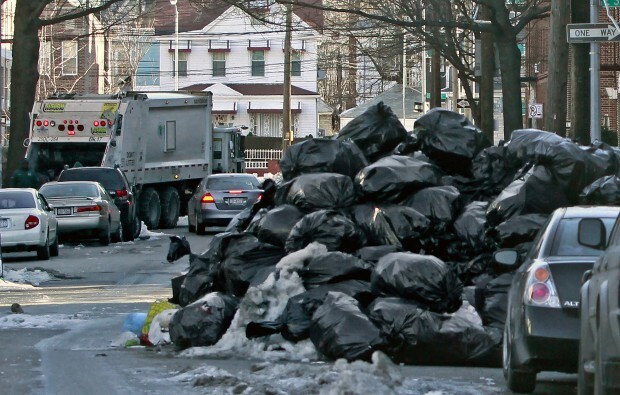 Back in New York, millions of people are suffering from the stench that radiates from the piles upon piles of trash. Not only does it impair our sense of smell, but it pollutes the air, contributes to asthma and can even cause cancer. The symptoms of these diseases set on at an early age and can destroy a person’s health for years to come. Another problem is communication with the poorer communities. Numerous people don’t even know when to take out their trash so they let it sit in the same spot for weeks and, as other neighbors follow their example, the pungent odor begins to fester, creating hazardous working conditions for people in the sanitation department. One resident of Staten Island observed, “The smell can get so bad that even the rats are scared away!” This powerful odor is also from the remnants of the nearby Fresh Kills Landfill. 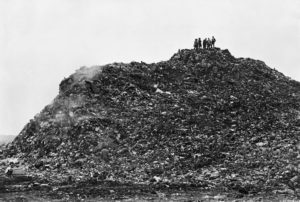 Standing at over 550 feet tall, the Fresh Kills Landfill was so massive, the scent stretched for miles and was unable to be fully exterminated despite countless efforts by community members in New York. To put that in perspective, the Landfill stood taller than the Washington Monument and smelled of the waste of 8 million people. The stench polluted the air and annihilated marine ecosystems in the Hudson River which, in turn, destroyed some of the more popular touristy parts near the Atlantic. 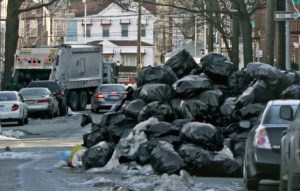 New York City’s Department of Sanitation (DSNY) leads the nation in size and budget for waste removal, spending a whopping 3.8 billion dollars in total annually. This costs the taxpayers, including myself, tons of money which could instead be used to remove the remaining landfills that are ripping apart our city. The DSNY has also implemented over 400 trash transfer stations which are the stops between the garbage truck drop off and the landfill. These transfer stations manage millions of tons of garbage and toxic waste, so much so that poison can seep into the Hudson River and then make its way into the ocean. This waste, combined with the toxic polychlorinated biphenyls (PCBs), from the GE dumps in the 40’s, 50’s, 60’s and 70’s have destroyed the once awe-provoking river. This decimated the diversity of the species in the Hudson and prevented a healthy ecosystem from being formed, leaving us with the murky waters we see today. In order to help restore the grandeur of New York City, I am going to begin a club at my school and spread the word about volunteering in cleaning up and planting fresh new greenery that will hopefully inspire others to help bring life back to the urban jungle. My goal is to partner with the Brooklyn Bridge Park Conservancy (BBPC) and the NYC Parks stewardship program to get my school on board in helping pick up trash in the park and around the Hudson. The park, located on Pier 1, is filled with the laughs of children, music from concerts and ambitious stargazers yearning to discover more, but only a few feet from these determined souls are piles of trash that I hope to clean up along with my fellow volunteers. In order to get my school on board, I will talk to my Campus Congress representatives, who speak for the students on the school board, about initiating a club to conserve the park and create a space for the school community to voice other concerns on the trash problem not only in New York City, but around the world. About six years ago, my school offered a sustainability class and was recently taken out of our program due to budget cuts. I would like to re-introduce the program to make people more mindful of what they are buying and throwing away and learn how to conserve what’s left of the natural beauty of our planet. To do this, I need the support of the student body and the staff to eventually take it up to the principal and the school board. One way I could sh ow the school how many people cared is by bringing around a petition and having students that want to join the class sign it so they have evidence of how many people want to make a difference. Another way I could persuade the board is by creating a presentation that encompasses all of the reasons why we need to learn about saving our planet and how we can start in our town. I would also add the benefits of switching over to more compostable meals in our cafeteria and starting a compost bin to the presentation. This would also help the city because our trash is combined with that of the 8 million other New Yorkers downtown. Additionally, I would like to organize a march in the city with some of my friends, teachers, classmates and city officials to raise awareness about the repugnant conditions that millions of city dwellers have to live through on a daily basis. With the help of the club members and other influential authoritative figures, I hope to lessen the environmental destruction our school inflicts and create a more sustainable pla net. Similar to my experience with Hawaii Outdoors Institute, I also hope that I can inspire others to start their own enterprises into the world of sustainability, conservation and a greener planet for years to come. Here, I was encouraged to discover my naturalist side and experience the immense effects humans have on the natural world. 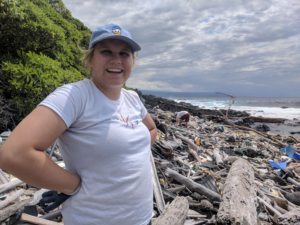 For example, when we went to South point to aid in efforts to pick up the trash that littered the once beautiful beaches, I was truly inspired to make a difference in this disastrous trash issue no matter how small. When we first arrived, I saw mounds of trash and my first thought was how much reminded me of home. This got me thinking about what I could do to help lessen the problem here when I realized that I needed to start small by raising awareness in my community. That experience is what truly drove me to want to help my community become more sustainable so our environmental footprint is a little smaller and the grass is a little greener.